Burberry is taking its branding to another level. With its new creative director Riccardo Tisci at the helm, more is more at the storied British house. Using wall wrapping Burberry kicked off its campaign to world dominate relaying on its revamped logo designed by Peter Saville. 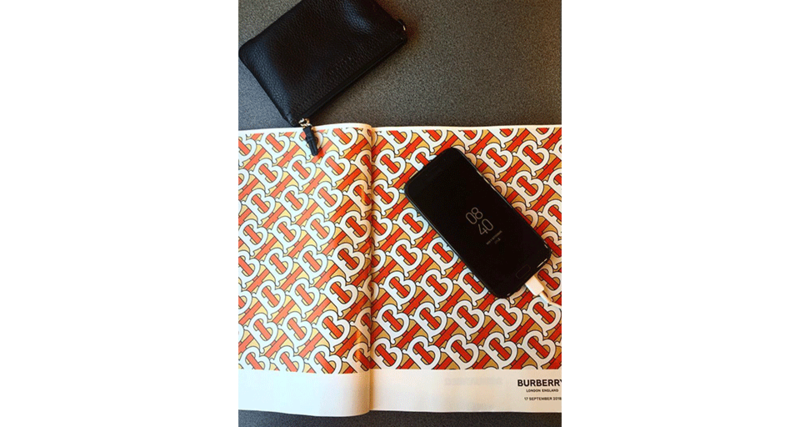 The unveiling came in the form of an Instagram announcement with images of the new and cleaner logo along with the monogram of the interlocking initials of the label’s founder, Thomas Burberry. Within few months the insignia found its way around the world. The powerful campaign took the new logo on brand’s own storefronts from London to New York to Milan to Seoul, wall scapes, billboards, and digital screen locations from bus to airport kiosks. An oversized inflatable #ThomasBurberryBear decked out in logo anchored the Xintiandi Taiping Lake in Shanghai, China. One of the most impactful activations happened over the simmer at Sunset Beach on Shelter Island in New York, that saw the monogram painted over oversized umbrellas and awnings. Viewable from water, land and sea it took a subliminal messaging to another level. Tisci’s debut at the house also celebrated the logo. Like an interlocking weave of a phenomenally well designed monogram, the collection was a reflection of British subtly and celebration of tailoring. The logo is featured prominently across accessories and ready to wear.